People power is the strongest force on Earth, able to accomplish extraordinary things against seemingly impossible odds. Greenpeace is so effective because we are a global community of members, activists, volunteers, and concerned citizens—wonderfully diverse people united in common purpose. And our community is growing, as more and more allies come together in the movement for a more just, green, and peaceful future. Only when all are safe and healthy can we have the better future we want to see. And right now with the rights and sovereignty of Indigenous communities around the world being trampled, from the Water Protectors at Standing Rock to the Forest Defenders in the rainforests of the Amazon and Indonesia and beyond, our solidarity and support is increasingly important. In spite of the Trump administration’s extremely regressive policies, in 2017 we saw notable wins for human rights, ocean and forest protection, water safety, and our climate. Greenpeace’s growing community made all of it possible, not only with monetary contributions but also with individuals taking personal action, giving of their time and their talents, and turning out in full force collectively to show the world what people power can do. Thank you for your part in it, for living your values, and making the future of our fragile planet a priority concern. You are the heart of this movement, and the reason Greenpeace is so vibrant. Greenpeace, Inc. is the leading independent campaigning organization that uses peaceful direct action and creative communication to expose global environmental problems and promote solutions that are essential to a green and peaceful future. Greenpeace Fund, Inc. supports Greenpeace, Inc. campaigns through research, public education, and grants for environmental advocacy. Greenpeace Fund, Inc. is registered with the Internal Revenue Service as a 501(c)(3) charitable entity. Please visit greenpeace.org to learn more about Greenpeace, Inc. and greenpeacefund.org to learn more about Greenpeace Fund, Inc.
Greenpeace Fund is consistently ranked among the nation’s top charities—for our achievements and for the high percentage of revenue that goes directly towards the protection of the planet. Greenpeace Fund is recognized by Charity Navigator with a four-star rating as having demonstrated financial efficiency and excellent accountability and transparency. Greenpeace Fund is proud to be a part of the CFC and to carry the “Best in America” seal from Independent Charities of America. Of the 1 million charities operating in the United States today, it is estimated that fewer than 5% meet or exceed these standards and fewer than 2,000 charities have been awarded this seal. This report is intended to provide a summary of all Greenpeace campaign activities. Please note that all donations to Greenpeace Fund, Inc. were solely used in connection with 501(c)(3) permissible activities. 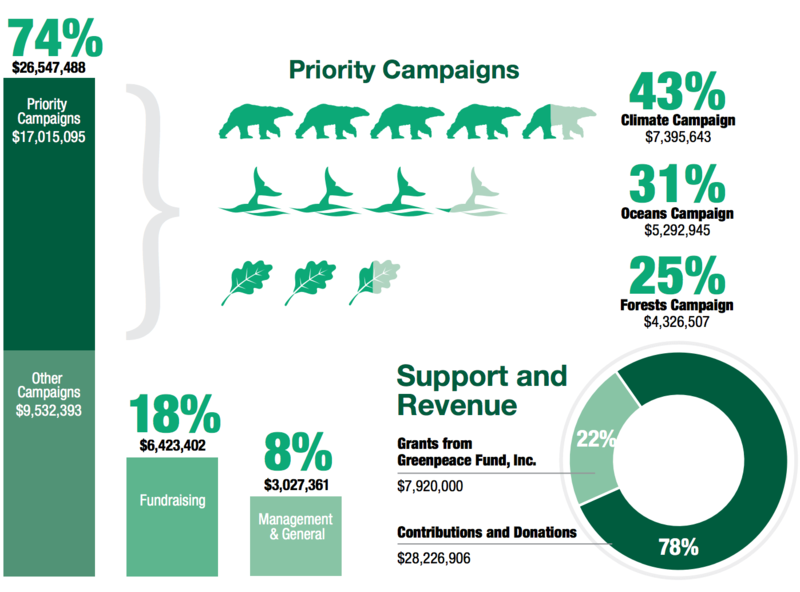 Statement of Activities – Greenpeace Fund, Inc. Statement of Activities – Greenpeace, Inc.
People’s Climate March in Washington, D.C. On the 100th Day of the Trump administration, we were in the streets of Washington, D.C. to show the world and our leaders that we would resist attacks on our people, our communities, and our planet. Arctic Sunrise departs New York City. In October, the historic Greenpeace ship Arctic Sunrise, toured the Atlantic coast to put the spotlight on two of the biggest threats to our climate and oceans—offshore oil drilling and plastic pollution. With stops in New York City, Norfolk, Wilmington, and Miami, Greenpeace used the ship to mobilize communities to stop expanded offshore drilling and the seismic blasting that would injure as many as 138,000 whales and dolphins. The ship tour also launched Greenpeace’s campaign to end the plastic pollution choking our oceans and killing marine wildlife. We collected and documented plastic found in harbors, at sea, and in nearby coastal and inland areas and also joined local communities for beach and river clean-ups. The Arctic Sunrise departed Miami in November to travel to Puerto Rico in support of the campaign for a green and just recovery from Hurricane Maria. Greenpeace helped organize the delivery of urgently needed materials, including solar systems, sustainable agricultural goods, and tools. Activists confront supply vessel Explorer II in the Indian Ocean. In May, the International Transport Workers’ Federation called for a moratorium on high seas transshipment by tuna long-line vessels in the Indian Ocean, Gulf of Thailand, and South China Sea, until companies implement fair labor standards throughout their supply chains in order to guarantee security and protection for fishers and seafarers.3 Then, following an intensive global Greenpeace campaign, Thai Union—the world’s largest tuna company with brands like Chicken of the Sea and many others—announced a new set of major reforms to tackle illegal fishing and overfishing, as well as improve the livelihoods of hundreds of thousands of workers throughout the company’s supply chains. 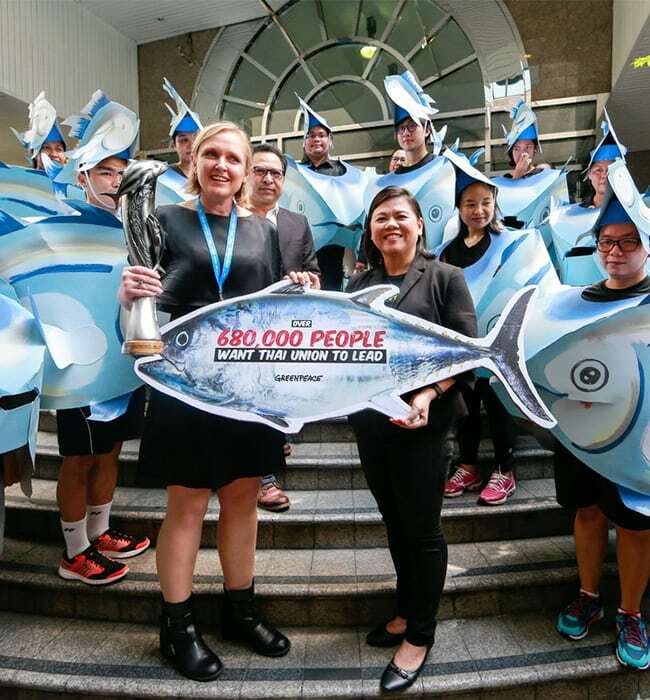 Action in Bangkok to urge Thai Union for more sustainable tuna. Pipeline marker in Abbotsford, British Columbia. After years of campaigning, demonstrations, and pressure led by First Nations, joined by workers, and Greenpeace, TransCanada pulled the plug on its massive Energy East Pipeline, taking an estimated billion-dollar loss on the project. The pipeline would have transported up to 1.1 million barrels of crude tar sands oil daily from Alberta across Eastern Canada. It’s a victory that is energizing our campaigns against other tar sands pipelines across North America, which threaten our communities, drinking water, Indigenous sovereignty and human rights, and our climate. For seven years, coal giants have waged war against the Pacific Northwest, proposing six massive new coal export facilities in Oregon and Washington to guarantee an expansion of coal mining in the Powder River Basin in Wyoming. Due to the tireless work of thousands of people in the Pacific Northwest along with persistent campaigning by Greenpeace, the companies behind these projects could not develop a single one of these proposed terminals. The health and beauty of the Columbia River Gorge will never have 44 million tons of coal transported through its fragile ecosystems. Kalasou Valley in West Papua. After years of working to protect the forests of Indonesia—home to amazing animals like orangutans, Sumatran Tigers, elephants, and a treasure trove of incredible wildlife—palm oil giant IOI Group committed to eliminate deforestation and human rights abuses throughout its supply chain. The Malaysian company was suspended from the Roundtable on Sustainable Palm Oil (RSPO) in 2016 for clearing peatlands in Kalimantan, Indonesia, and dozens of companies including Unilever, Mars, and Nestlé cancelled contracts with IOI as a result. At the beginning of 2017, IOI began proactively monitoring its palm oil suppliers to ensure they are not destroying rainforests or peatlands. Greenpeace will be watching closely to make sure IOI follows through on ending deforestation. We advised companies intending to resume trade with IOI to specify in their contracts that the company must demonstrate ongoing progress in line with its Sustainable Palm Oil Policy and the additional commitments it made. “Our Voices are Vital” activities in Italy. In October, the United States District Court for the Northern District of California dismissed all claims in the controversial case that major logging company Resolute Forest Products filed against Greenpeace and others. The court’s decision sent a clear message to corporations that attacks on core democratic values like freedom of speech and legitimate advocacy on issues of public interest will not be tolerated. But corporate intimidation tactics continue. In response to the powerful Indigenous-led movement at Standing Rock against the Dakota Access Pipeline, its builder, Energy Transfer Partners, attacked Greenpeace and others with a strikingly similar Strategic Lawsuit Against Public Participation (SLAPP). These lawsuits are part of a pattern of corporate bullying via the legal system, but Greenpeace will not back down. We will continue our important work defending our forests, challenging new oil and gas infrastructure, building powerful alliances, and fighting for free speech and public participation in our democracy. 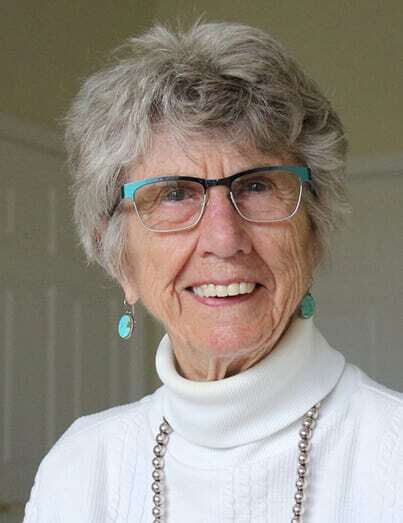 Mrs. Martha Osborn Vinick is a deeply committed Greenpeace supporter whose lifetime activism has spanned from the 1982 anti-nuclear demonstration in New York City’s Central Park to the 1999 Hague Appeal for Peace to her work with “The Green Team,” the local environmental group she founded where she currently lives in Sarasota, Florida. Martha has chosen to include Greenpeace in her legacy giving, dedicating support for peace and sustainability for future generations. She is a wonderful inspiration and has our enduring gratitude. If you would like to know more about how you can remember Greenpeace in your estate plans, please contact Corrine Barr at 1-800-328-0678 or corrine.barr@greenpeace.org. On April 27th,guests at the 2nd Annual Greenpeace Backstage gala gathered at the West Coast Action Center in Oakland, California, for a rare glimpse into what happens behind the scenes and what makes Greenpeace so effective in taking action to save the planet. It was a chance to experience firsthand the magic of Greenpeace, to see the techniques and equipment used in our iconic actions, and to feel the thrill of a surprise mini-action. Guests also had the opportunity to hear from inspiring guest speakers, bid on one-of-a-kind silent auction items like a ride in Greenpeace’s airship or hot air balloon, and mingle with like-minded people who together make up the wonderful and growing Greenpeace community. We began 2017 with a RESIST banner dropped over the White House to spread hope throughout our community and wove that declaration of intent throughout our activities all year long. Your support has been critical to our successes—and not just your financial support. When you come out and march with us, or join us in our Summer of Resistance, or greet us at port during a ship tour—all of your actions help advance our growing movement for a green and peaceful future. 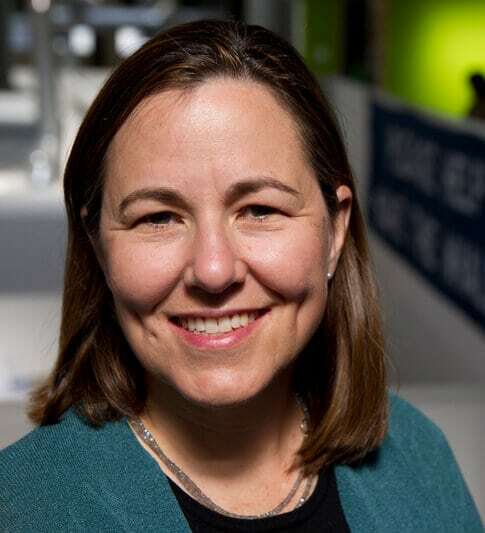 I’m pleased to report that we expanded our base of supporters in 2017, making our people power stronger than ever and helping us engage new communities and broader audiences. It was so great to see many of you during the Arctic Sunrise’s tour of the Atlantic Coast. I was as impressed as many of you to tour this sophisticated ship that sails all over the world and campaigns to save the most biodiverse, important places on Earth. Overall, 2017 was a year of wonderfully positive growth in our community, and one of the most important things you can do personally as a supporter of Greenpeace is help build on that momentum by spreading the word in your circle of family and friends. Thank you for your advocacy on our behalf, for helping us continue to grow our community and strengthen the movement for a more green and peaceful future. We couldn’t do it without you! In the United States, Greenpeace fulfills its role in protecting the environment through two corporate entities: Greenpeace, Inc., a nonprofit organization formed under Section 501(c)(4) of the Internal Revenue Code, and Greenpeace Fund, Inc., a nonprofit organization formed under Section 501(c)(3) of the Internal Revenue Code. 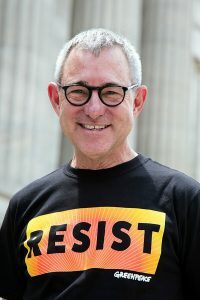 Greenpeace, Inc. furthers its mission of protecting the environment through research, advocacy, litigation, and lobbying (direct and grassroots). The organization also bears witness to environmental degradation and takes action to prevent it. Contributions to Greenpeace, Inc. are not tax-deductible. The mission of Greenpeace Fund, Inc. is to promote and protect the environment through research and public education. Greenpeace Fund, Inc. also makes grants to other nonprofit organizations for activities that are consistent with its mission. Contributions to Greenpeace Fund, Inc. are tax-deductible. Grants – Greenpeace Fund, Inc.